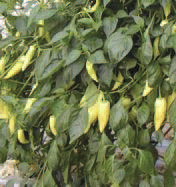 Hot Pepper | Shneor Seed Co.
Hot-Pepper - Strong Pungency (Hybrid F1). Fruit is large, straight and turns from light green to red when matures. 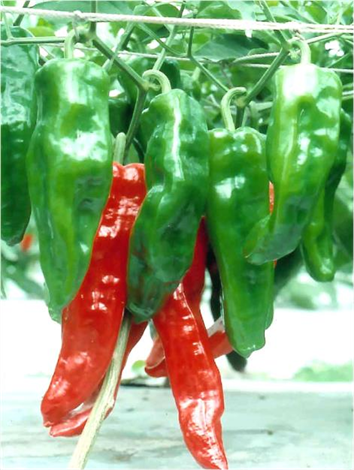 Can be picked young (green) or ripe (red) to meet different needs. Fruit is 16 cm long, 2 cm wide and weighs 30-40 gr. It has thick flesh - 3 mm, with strong pungency. Plants are medium tall, very early in maturity - can be harvested 85 days from transplant, slightly spreading with concentrated harvest. Resistant to CMV. Fruit color: green/red. Weight: 50 gr. Size: 14x4 cm. Flesh thickness: 0.3 cm. Medium hot Pungency, medium shipping and storage. Maturity: 90 days from sowing. Optimal temperatures: 18-30℃. Resistances: TMV, BW spot R3 (MR). Very hot pungency, good shipping and storage. Fruit color: yellow/ light red. Weight: 45 gr. Conical type, uniform. Special color and flavor. Size: 15 x 3.1 cm. Flesh thickness: 0.3 cm. Around 110 days from sowing. Smooth fruit surface. Optimal temperatures: 18-32℃. Compact plant Fruit size: 5-7 cm long. For open fields and greenhouse. Very hot. Medium tall plant, slightly spreading.very early in maturity, harvest 85 days from transplanting.Fruit weight: around 30-35 gr.Fruit shape: large and straight Fruit size: 16-18 cm long.Color: dark green to red when ripe.can be picked young (green) or ripe (red).Tolerant to CMV.Thick flesh (3mm) with strong pungency. Very productive plant, spreading,well branched with short internodes,harvest 90 days from transplanting.Fruit weight: 25gr. 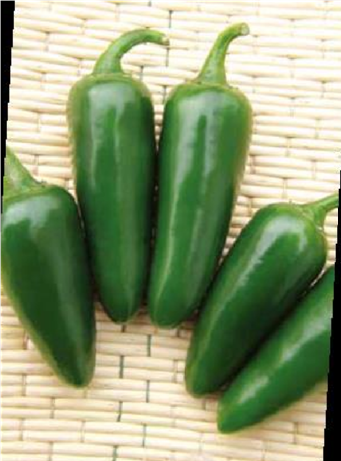 shape straight,size 15cm long x 1.5cm wide.Color: dark green to red when ripe.can be picked young (green) or ripe (red).Tolerant to CMV.Thick flesh (2mm) very pungent.Good for both consumer and processsing, good for storage. Medium tall plant,slightly spreading, very early maturity,85 days from transplanting. Fruit weight: around 25-30 gr.Fruit shape: long and curly Fruit size: 16cm long x1.5cm wide.Very light green to red when ripe. 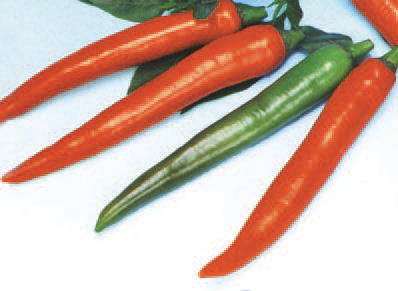 can be picked young (green) or ripe (red). Tolerant to CMV.Thick flesh (3mm) with strong pungency. Medium hot pungency, medium shipping and storage. Fruit color: green/red. Weight: 60 gr. Size: 3.7x16 cm. Flesh thickness: 0.3 cm. Surface smooth fruit. Optimal temperatures: 18-25℃. Days to maturity: around 80 (from sowing). Resistances: BW (MR). Good for fresh market as well as processing like canned goods, pickling. 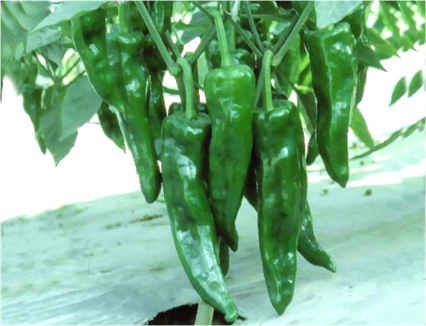 High yields of attractive shape, dark green color. Average fruit size: 8-9 cm and cylindrical blunt shape. 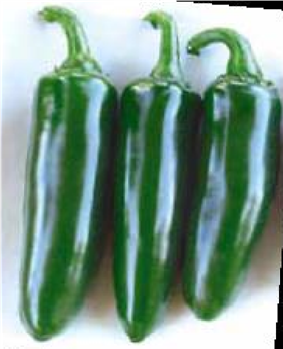 Jalapeno pepper which can be used for processing purposes. 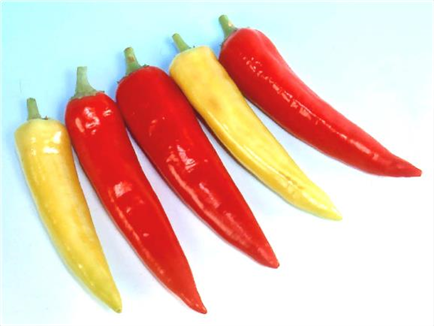 Attractive fruit shape and average fruit size: 6-8 cm with cylindrical shape.